First, let's start with a brief definition of sitemap: sitemap is actually a list of pages that exist on a web site. That list is usually hierarchically organized and broken down into logical parts. You may look on a sitemap like a index page for any book. It is a list that shows everything that is on site and tells where to find it. Some developers and webmasters argue that in some cases, better term to be used for sitemaps is site index but the widely accepted term is sitemap. Use of sitemaps has grown bigger with the expansion of internet. Basically there are two types of sitemaps. First and older ones were sitemaps made for users. Just like book index pages. General purpose of these sitemaps is to make it easier for the visitor to find the information they are interested in, and also to see at one place what information is offered. 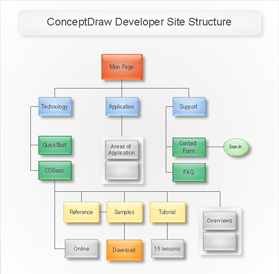 The second type of sitemap is the ones that were introduced by Google and other internet search companies. The base principle of how search engine collect information is hyperlink or a link. By introducing an XML defined sitemaps, there was a solution for indexing pages on sites which actually don't have any incoming hyperlink. If there were no sitemaps, they could stay unseen for years. Also, the crawlers from search engines have somewhat unpredictable behavior and when they index pages they don't go much in depth while following links. So, whit using XML sitemap it became possible to send all pages from the site to be indexed at once. Some engines find sitemaps, and others wait while you submit it. Submitting and creating sitemaps does not guarantee that your site will be indexed, but it makes a lot easier for engines to do it. By this purpose, sitemaps are very big part of SEO optimization, as the goal of SEO is that all information you want to be found, can be found. Sitemaps make it easier to show all pages, but especially the pages which use flash movies or menus written in java script which are hard for engines to understand or follow. When you make and use sitemaps there are some basic rules to follow. If you are making sitemap for visitors, you have to make sure that all pages are sorted by reasonable criteria that the sitemap isn't visually confusing and that sitemap is accessible from any page on site. Creating and sitemaps for engines requires a bit knowledge of XML, but luckily there are many automatic sitemap generators available. Rule of thumb is that you should generate one sitemap for each 200 pages. Also the SEO people say that any page on your site should not be more than two clicks away, so keep this in mind when creating sitemaps. Also, you have to make sure that sitemap is accessible and that every now page created on site is indexed in sitemap.